Brownlie Towers residents Sylvia Brandis and Brian Clark. 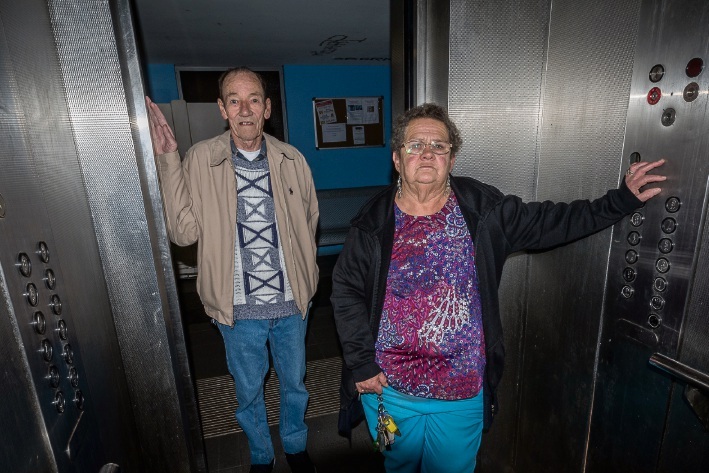 Brownlie Towers residents Sylvia Brandis and Brian Clark at the broken lifts at B-block last week. 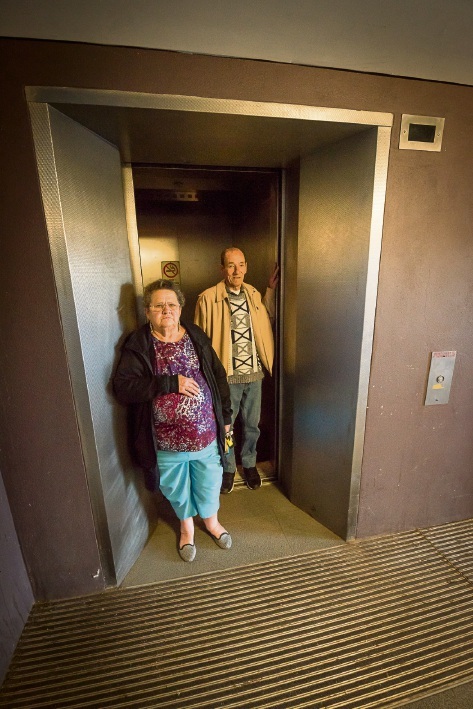 ELDERLY residents of Bentley’s Brownlie Towers were forced to trudge up and down stairs for five days to get to their units in B-block after the lifts broke on Thursday, June 22. Residents Committee president Sylvia Brandis (69) said she was concerned for the health of elderly residents using stairs to get to and from their units. Ms Brandis said the Housing Authority, which maintains the building, was informed on June 22 that the lifts had broken but took five days to repair them. “I am so used to them taking forever and a day to do anything around here, it didn’t surprise me it took five days,” she said. Ms Brandis said there were about 12 elderly people who lived in B-block. “Aureen is on the seventh floor, Brian is on the sixth floor; if they needed an ambulance while the lifts were down, how in the hell were they going to get help up there,” she said. She was told by the Authority on Monday, June 26, that a further two to three days were needed before the two lifts could be repaired, but by Tuesday morning last week the lifts had been fixed. “If it hadn’t been for me phoning the Canning Times, I would still be waiting,” Ms Brandis said. B-block resident Aureen Vitali (91), who has had two hip replacements, said she found it difficult walking the flights of stairs to her apartment and had spent the weekend staying with friends due to the lifts not working. Committee vice-president Brian Clark (71), who also lives in B-block, returned from hospital two weeks ago after surgery to insert two heart stents. He said the breakdown of the lifts had caused him to stay in his unit more so as to avoid having to make the journey up and down stairs. Ms Brandis said the problems with the towers were not isolated to the broken lifts. She said the rubbish chute was often blocked, lighting on walkways was poor and A-block’s foyer lights weren’t working. “They are not fixing it because they are moving us all out,” she said. She said residents were told by the Authority in March 2017 that they would have to move from the towers temporarily later this year so that plumbing could be fixed. Authority commercial operations acting general manager Nigel Hindmarsh said as part of the Bentley Regeneration Project’s vision, all of the remaining tenants in the towers would need to be relocated. “Housing has contacted the tenants to start discussing alternate accommodation opportunities and will continue to engage with them as appropriate alternate housing becomes available. 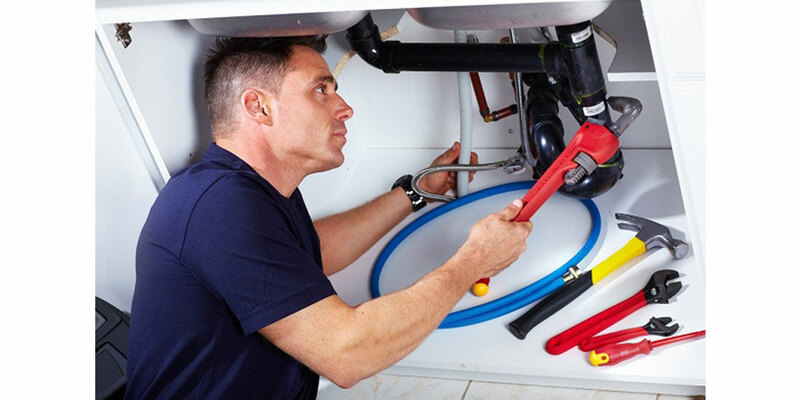 It is anticipated that this process will take six to 12 months,” he said. Mr Hindmarsh said both lifts in B-block had not been functioning due to water leakage and were decommissioned to ensure tenant safety. He said one lift was returned to service about 8pm on June 26 and the other lift was inspected the next morning and was now functioning.